Did you ever try to press heat transfer vinyl on an insulated lunch box, leather, polyester or lycra/spandex and worry that you might damage or melt the material due to the excessive heat? I just got my hands on some new-to-the-craft-market heat transfer vinyl and I'm loving it for these types of heat sensitive materials and time savings! Literally you can press three times as fast. 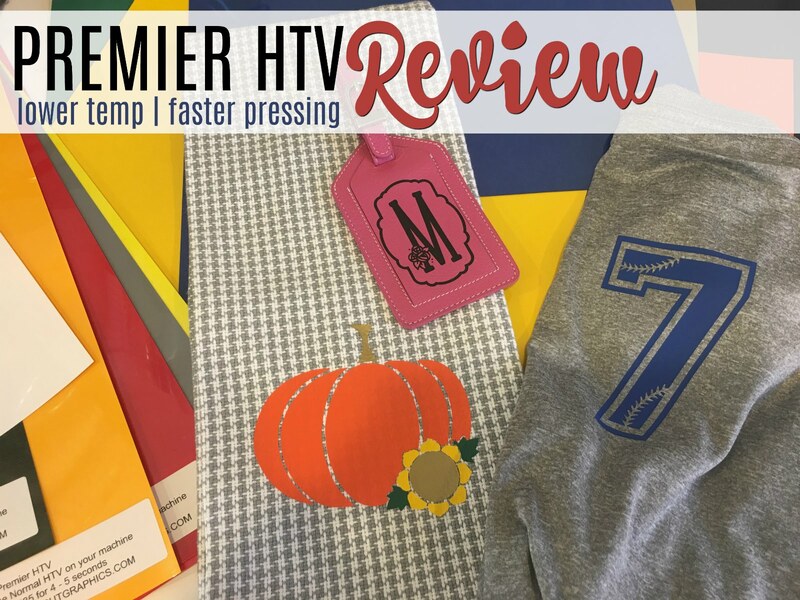 Instead of requiring a pressing temperature of 305 for 15-20 seconds, the new Clean Cut Graphics Premier HTV only needs to be pressed at 285 degrees for 4-5 seconds. That's the full press time, not a tacking time! This means the risk of melting a lunchbox or zipper or scorching leather or lycra is greatly reduced! It also means you can press three times as fast. And ever better news, not only did it cut well it also weeded great! Look how tiny some of the areas in this design are - and they cut and weeded without any issues! Nothing was lost in the cut...but how would those little areas do when pressed for just 4-5 seconds on leather?! As you can see...I peeled hot after just a 5 second press and everything stayed exactly where it was supposed to - on the leather tag not the carrier sheet! I also wanted to see if this Premier HTV would shrink on a layered design that took multiple presses. Shrinking happens when heat transfer vinyl is over-heated for too long of a time. But when layering HTV designs each layer must be pressed separately so there's no way around extra time pressing the first layers. The pumpkin and sunflower design did not seem to shrink at all despite a total of 4 presses. However, you can see that the pattern of the towel is slightly visible through the orange HTV. The Premier HTV comes in 12x15" sheet in 16 different colors and is found exclusively at Clean Cut Graphics!